Northern central part of Japan offers many “Must-See” places, such as Shirakawago, Takayama, Tateyama Kurobe alpine route. How do you combine these places, Tokyo, Kyoto and Osaka. In this post, I will show you the sample itinerary which includes these places from Tokyo to Tokyo in 10 days by 7 days JR Pass. In this sample itinerary, I use Limousine bus one way and 24 hours subway pass deal from Narita airport at 3,400 yen. Tokyo subway covers most part of Tokyo. You can access to most of places in Tokyo by subway. You can start using JR pass after you stay in Tokyo. So you can add the day of subway pass to extend your stay in Tokyo. Especially if you want to visit Tokyo Disneyland or/and DisneySea, you spend one full day easily. You need to stay in Tokyo more than 3 nights. You can visit outside Tokyo if you add other deals. I have several posts to show you how to visit surrounding area of Tokyo, such as Mt. Fuji (Lake Kawaguchi), Hakone, Nikko, Yokohama and Kamakura. On this day, you start using 7 days JR pass. But you need to add Tateyama Kurobe option ticket at 9,000 yen for Nagano to Toyama via Alpine route. The trips of Tokyo to Nagano and Toyama to Kanazawa by Hokuriku Shinkansen are covered by JR Pass. Enjoy sightseeing in Kanazawa until lunch time. After lunch in Kanazawa, leave for Takayama with sightseeing in Shirakawago on the way. The bus in Kanazawa city and to Shirakawago/Takayama are not covered by JR pass. You may add Hokutetsu bus one day pass for sightseeing in Kanazawa. It is sold at 500 yen. The one ride fare is 200 yen in Kanazawa city. You can get the worth by only three rides. Pick up your luggage before leaving from Kanazawa. You will also find the information about reservation in this link above. Advanced reservation is required from Kanazawa to Shirakawago. Please keep it in your mind. I visited Shirakawago in 2016 winter. Please see the link below to find my trip report. Preserved path in Takayama. It is very popular tourist district in Takayama. Enjoy sightseeing in Takayama. You can visit morning market and preserved street. You can take Limited Express Wide View Hida from Takayama. If you want the direct train to Kyoto, you can take the following train. I recommend you to stay near Kyoto station. It’s most convenient location in Kyoto. Most of places in Kyoto can be accessed directly by bus or train from Kyoto station. I show you one day sample itinerary in Kyoto. This includes most of big names in Kyoto, such as Arashiyama, Fushimi Inari, Kiyomizu-dera and Gion. Sagaarashiyama station is located in Arashiyama. It is not located in the center of Arashiyama but you can walk to most of places in Arashiyama. You have 4 hours for sightseeing and lunch in Arahsiyama. After Arashiyama, proceed to Fushimi Inari shrine. Inari station is located just in front of Fushimi Inari shrine. Even if you take a bus from Kiyomizu-Gojo station, you need to walk about 1 km. There is no buses to get Kiyomizu-dera directly. If you do not walk or travel with senior, do not hesitate to take a taxi. It costs less than 1,000 yen. There are sightseeing spots, like Sanneizaka, Ninenzaka, Yasaka no Tou (pagoda) between Kiyomizu-dera and Gion. I highly recommend you to walk to Gion. In my estimation, you stay in Kiyomizu-dera about 1 hour (15:45 to 16:45) and spend 2 hours from Kiyomizu-dera to Gion. If you want to visit more temples from Kiyomizu-dera to Gion, I recommend you to shorten the time in Arashiyama or start your trip earlier. Some of temples are closed by 17:00. You should leave Arashiyama by 12:00 and make one extra hour after Kiyomizu-dera. If you want to move to Osaka, you can move there on this day. It takes 30 minutes by Special Rapid train. If you stay in Shin-Osaka, you can take Shinkansen in 10 minutes from Kyoto to Shin-Osaka. You can stay in Osaka only and can make day trip to Kyoto from Osaka. It is totally up to you. Leave from Kyoto in early morning for Osaka and enjoy full day sightseeing there. I recommend you to stay near Shin-Osaka station. You can get there from Kyoto station directly. You can drop off your luggage there and start sightseeing. You can take an ordinary trains but it is morning peak hour. Though it is such a short ride, you can avoid taking busy train by Shinkansen ride. You may drop off your baggage at your hotel in Shin-Osaka. If you do my sample itinerary below, please purchase Osaka Kaiyu ticket (2,550 yen) at subway Shin-Osaka station before starting trip. This deal includes admission for Kaiyukan aquarium and 1 day subway unlimited ride. JR Pass does not cover subway ride. You should have this deal. Enjoy Aquarium and eat lunch at Tenpozan Market Place. *Leave your baggage at your hotel before you leave for Tokyo. Tanimachiyonchome station is located beside Osaka Castle Park. But this park is quite big. You have to walk around 20 minutes to get the castle. Osaka Business Park station is also located beside Osaka castle park. You can get Shinsaibashi directly. 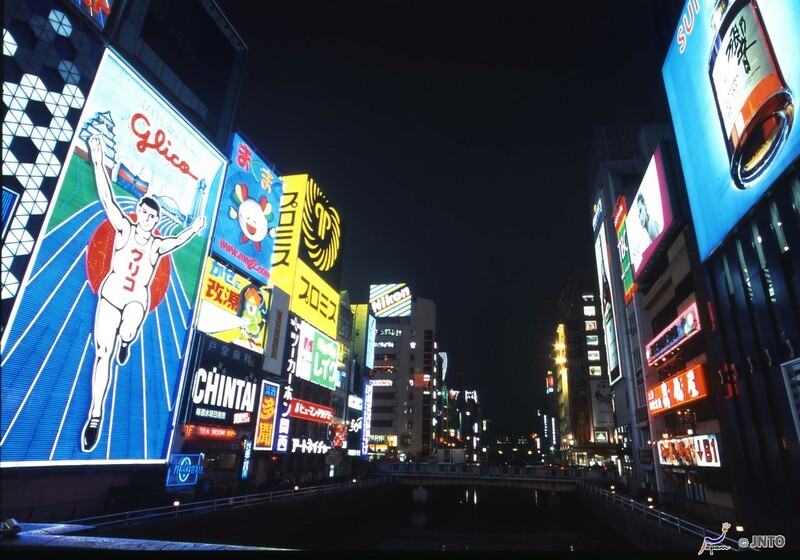 After arrival at Shisaibashi, enjoy eating and shopping in Dotonbori and Namba. Subway runs very frequently until midnight. I include day trip to Himeji and Kobe before move to Tokyo. However you can stay in Osaka and visit more places. You may visit Nara instead of Kobe and Himeji. Shinkansen “Hikari” runs almost every 30 minutes. The train in the sample itinerary below is the last Hikari to Tokyo. You can skip Osaka, Nara, Himeji and/or Kobe and take earlier train to get Tokyo earlier. It is totally up to you. Leave your baggage at your hotel in Shin-Osaka. Special Rapid Service is a sort of commute train. But it is better and faster way to get Kobe from Himeji than Shinkansen. Because Shinkansen station in Kobe is Shin-Kobe which is not located in downtown Kobe. And also Special Rapid Service runs every 15 minutes in daytime. It is very frequent and convenient train service. You may have a lunch time at Kobe waterfront area. After that, continue sightseeing in Kobe. Many of places in Kobe can be accessed on foot from Kobe station and Sannomiya station. Please see the link below to find more information about Kobe. You can take Special Rapid Service at Kobe or Sannomiya to Shin-Osaka. Pick up your baggage before you go to Tokyo. As I mentioned above, this Shinkansen train, “Hikari 538” is the last train to Tokyo by JR pass. Please see the links below to find Shinkansen timetable. You may find the timetable to Himeji too. You can take Narita Express to get Tokyo by JR Pass. By the way, JR Pass 7 days covers the following trips. It costs 46,100 yen if you do not use JR pass. JR Pass 7 days is 29,100 yen. You can save more than 17,000 yen. The last ride of Narita Express is 3,020 yen. Even if you do not use JR pass for this ride, you still can get a big saving. If you want to spend one more day in Osaka, Kyoto, Takayama or Kanazawa, it will work. In this case, you can purchase Limousine bus and subway pass round trip deal. This is just a sample itinerary. You can arrange or make some changes, whichever you like. I hope this sample itinerary will give you some thoughts to build your trip plan. I will go to Japan on March 13 ‘2019 for 9nights. *13 March : arrive at Narita 18.00 so i will stay at Tokyo. Should i use 7days JR pass? And is it correct i need to active it the 1st day i arrived. You may use JR pass from 13th to 19th. Pasmo is okay but Tokyo Subway Ticket may give you a big saving. Pasmo does not offer unlimited ride but Tokyo Subway Ticket does. Access bus is most affordable choice to get Narita. We will travelling to Japan mid of Apr, 5 people including 1 elderly and 1 child 7 years. Arrive 5.30am at Haneda airport and back home from Osaka 10am flight. Day 7 Tateyama Alpine Route – overnight Kanazawa or Takayama? After Mt Fuji, should I explore Tokyo 3 night first then Kusatsu. Then from Kusatsu go to Nagano – Alpine Route. I am trying to reach Nagano station early and catch Ogizawa bus 8.15. Which way do you think more accessible? Both depart Tokyo or Kusatsu requires early start? After Alpine Route long day where is the best to stay overnight? Kanazawa or Takayama? Is 7 JR pass worth for our trip and what other pass we need? You should go to Kusatsu after Fuji and then stay in Tokyo. As you thought, Kusatsu is closer to Nagano than Tokyo by distance. However the trip time from Tokyo is shorter than from Kusatsu because you can get Nagano by Hokuriku Shinkansen from Tokyo directly. You have to change trains and buses a few times if you travel from Kusatsu to Nagano. And you cannot get Nagano from Kusatsu by 8:15. Please see the link below to find the timetable. This is current one, so it may be changed in next April but I don’t think it will be almost same. You have to take 6:16 departure to get Nagano by 8:15. Next train arrive in Nagano at 8:08 but this is too late to move to bus stop and purchase a ticket. 6:16 departure is only choice. Try to book a hotel Tokyo or Ueno station. If you start from Kusatsu, you cannot get Nagano by 8:15. Kanazawa is better than Takayama after Alpine route. You can get Kanazawa from Toyama by Shinkansen. It runs very frequently. You can find the timetable in the link above too. But if you go to Takayama, you may need to take a local train and need to change trains on the way. It is slow and inconvenient. But if you intend to see all three places, Kanazawa, Shirakawago and Takayama in one day, it is too tight. You have to give up one of those three. You may be able to see Kanazawa after Alpine route. But you will be very tired. And also mid April is super super busy on Alpine route. You may spend many more hours than average trip time. So don’t try to see all three places in one day. If you want to see all three places, I recommend you to stay in Takayama after Kanazawa and Shirakawago. If you give up Takayama, you can make a round trip to Shirakawago from Takayama. Train to Kyoto from Kanazawa runs more frequently than train from Takayama. If you go to Kyoto from Takayama, you have to change trains at Nagoya. There is one trip to Kyoto from Takayama. But it is only one trip a day. JR pass is recommended for day 3 to 9. You can take a bus to Fuji from Haneda. On day 3, you have to pay a regular fare to take Fuji Kyuko railway from Kawaguchiko to Otsuki. After Otsuki, you can use JR pass. You must exchange JR pass before you leave Haneda. You cannot exchange the pass at Fuji area or Otsuki station. You can exchange it at Haneda in advance. Please use a regular ticket for Kyoto to Osaka. Thank you so much for your detailed information. I will decide to stay at Kanazawa after long day at Alpine route. If I give up Takayama, after Shirakawago I still need to go back Kanazawa to catch train to Kyoto? If I want to explore Takayama, an extra night is recommend then I need to back Kanazawa to catch train to Kyoto as it’s more frequent and faster? All these transport cover by JR pass? No extra fees required? I notice that I need to make a booking for Noshi bus to Shirakawago, can it book online? Or I have to call? You cannot book a seat for train online or phone. You have to make it at any major JR stations after you arrive in Japan. My family will be travelling to Japan this November for 11 days. Spend first 3 days in tokyo , then Visit the neigbouring cities of tokyo, then do Shirakawago /Nagano n takayama during the last few days. back in tokyo on last day, then to Narita Airport. but our concern is- how to maximise the JR pass. n which pass to buy. Also, the airport deals (for passengers arriving at the airport). it’s still very confusing to work out the types of passes to use to save cost. We are travelling with a 70-year old lady, a child. As long as you go to Shirakawago and Takayama, you need JR pass anyway. I recommend you to use JR pass 7 days in the last 7 days of your trip. And try to include Nagano (or Nagoya), Takayama in this last 7 days. It will cover until you go back to the airport. And you can add some other deal for airport to Tokyo and sightseeing in Tokyo. You may use JR pass for outside Tokyo. But it does not help so much for the trip to Fuji and Hakone. Your itinerary is really clear, systematic and helpful. Thank you for sharing it. I will visit my first time in Japan on October with elders and I would like you to check my itinerary so I can use JR pass effectively. does it better I stay in Hakone then go to kanawaza/takayama? is it possible to explore Kyoto when Matsuri? I read there are lots of traffic restriction and bus may be not available. You should use 7 days JR pass because 14 days pass is pricy. But you need to start using it on day 5 when you leave Tokyo and it is expired at the end of day 11. You cannot use it on day 12. If you keep this itinerary, JR pass does not work. You have to use regular fare ticket for city to city. If you want to use JR pass, you have to catch the last Shinkansen to Tokyo from Osaka on day 11. You may use Tokyo Wide Pass for trip to Hitachi Seaside Park. And also you can use it for access to Odawara on the way to Hakone. You can add Hakone Free Pass at Odawara. You don’t need to stay in Hakone. Even if you stay in Hakone, you need to move to Tokyo before access to Nagano. When Kyoto holds festival, as you think, traffic is terrible. But on day 9, all places are within walking distance from Gion. You will be okay. Tsukiji will move on Oct 11. You cannot get there unfortunately. Previous Previous post: Takikawa station guide. How to catch a local train to Furano.